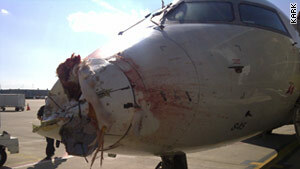 Damage to the aircraft's nose was severe after it struck a flock of cranes near Little Rock, Arkansas. (CNN) -- A commuter plane with dozens of passengers aboard struck a flock of large birds, forcing the pilot to make an emergency landing, the Federal Aviation Administration said Friday. Atlantic Southeast Airlines Flight 5087 was coming in for a landing at the Little Rock National Airport in Arkansas when the pilot made an emergency call at 4:38 p.m., according to FAA spokesman Lynn Lunsford. The plane landed about 30 minutes later with "significant damage to the nose," said airport spokesman T.J. Williams. Photographs taken of the plane after it landed revealed a gaping hole at the tip of the aircraft, along with several dents. At least one dead crane was still attached to the plane's nose after it landed. A total of 49 passengers and crew members were aboard the plane when the incident occurred. Officials say no one was injured. ASA is a regional partner of Delta Air Lines.